Cute & creepy Halloween crafts, frightfully fun projects for ghouls of all ages. 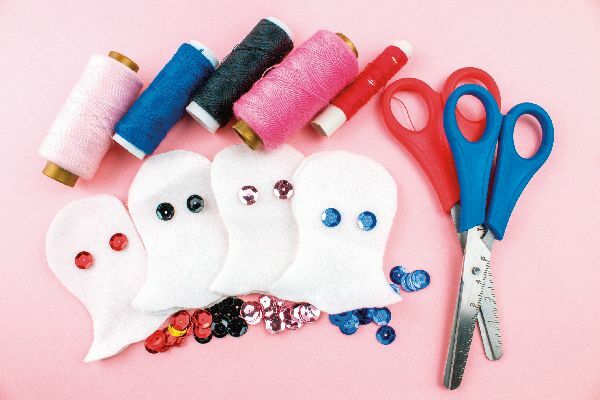 GHOSTLY FINGER PUPPETS: Cut a “handful” of two-sided ghost shapes out of felt and glue or sew on sparkly eyes (depending on the age of your child, adhesive rhinestones work well, too). Stitch up the edges, leaving the bottom open for fingers. 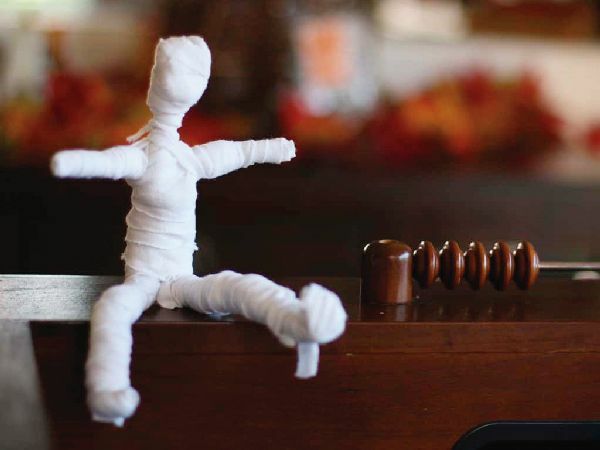 Kids can also stuff with cotton for a sweet and spooky doll, or suspend from twine and hang over a mantel. Works great with pumpkin shapes in orange felt, too. PAINTED SKULLS: Borrowing from Mexico’s colorful Day of the Dead tradition – but what a fun opportunity to paint a skull! 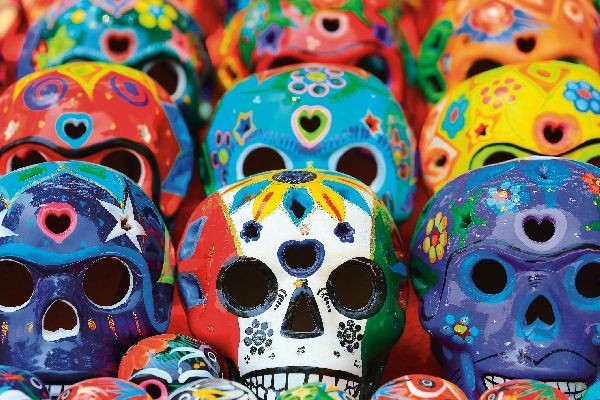 Look for the DIY Ceramic Skull (plus ceramic paint, glitter, rhinestones and more) at Orientaltrading.com. Kids can handle this project (the painting doesn’t have to be perfect), but they might need help handling the breakable ceramic. 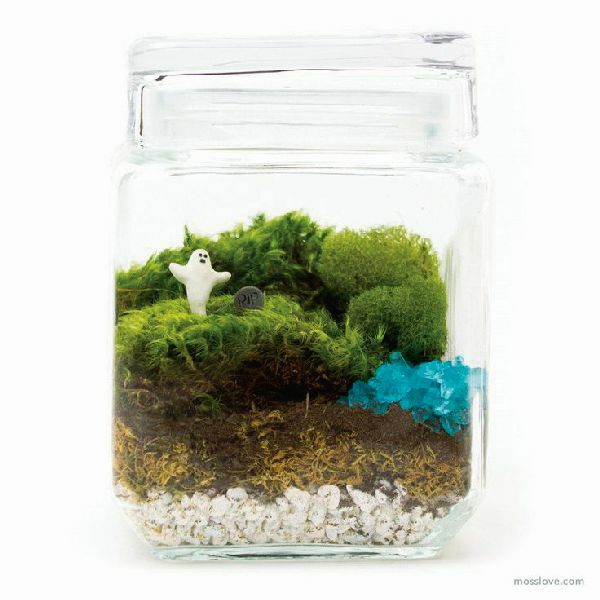 GHOSTLY TERRARIUM: Craft your own spooky, mossy world, like this one from Mosslove.com. In a clear glass jar, layer mini skulls or skeletons from Orientaltrading.com or Target, or just used gray gravel. Next, layer sheet moss, soil and live moss, plus a corner of crushed blue glass for “water.” Top with a plastic ghost or skeleton from Orientaltrading.com. PUMPKIN MUMMY: Glue googly eyes to a round piece of paper or felt and glue to the pumpkin, then adhere the paper or felt mouth. 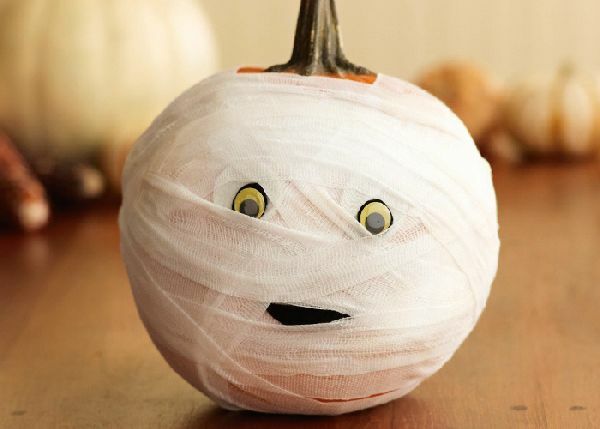 Wrap the pumpkin in layers of gauze and glue at the ends. You can also try this using a Styrofoam ball and adding a pipe-cleaner “stem” to the top to make hanging decorations. Tip: For all outdoor crafts, felt works better than paper, as it withstands the weather best. BENDABLE WIRE MUMMY: Bring to life your own personal mummy pal. Start with 5 feet of outdoor garden wire twisted into the shape of a figure. Cut an old white T-shirt into strips and start wrapping, then add a dab of glue at the end. For a full tutorial, visit Kiwico.com.